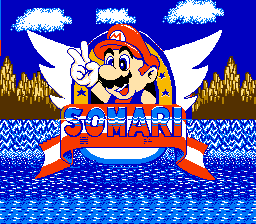 Somari is a home made game for the Nintendo Entertainment System [NES] found in a fair few pirate Famicom carts. 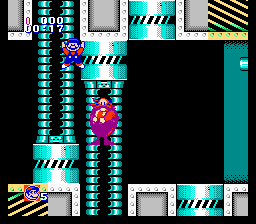 Basically the game is a copy of Sonic 1 Megadrive for the NES, with Mario instead of Sonic! Somari's play mechanics are similar to the Sonic's, but are horribly glitchy and unresponsive. Oddly enough, the Sonic spindash was added to the game despite it not being in Sonic 1. This is the Green Hill Zone. 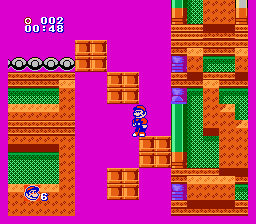 The graphics have been severely broken down into very basic colours to fit with the NES Palette. 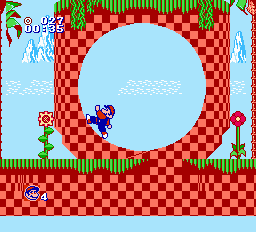 Here we see Mario going up a loop-de-loop just as Sonic would. 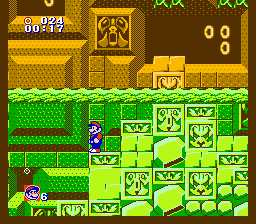 The level design itself is also changed quite a bit, not staying with the original very well. Here we can see some oddly placed textures and a very short Palmtree. Here is the Marble Zone in 8-bit glory. Lava still flows and the hidden passageways still exist. Some platforms can set alight like the original, but they won't bob up and down as a precaution. 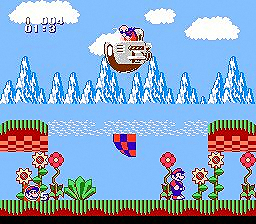 Here is Mario in Spring Yard Zone. 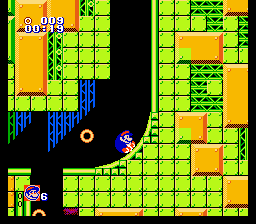 This zone is the most crippled, since many platforms [like these ones here], do not move at all, They're simple obstacles. 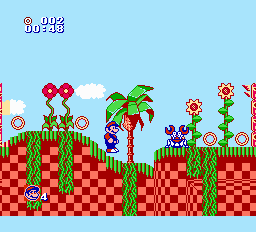 Because the original level was quite basic, this level is the closest to the Megadrive look, without the background. 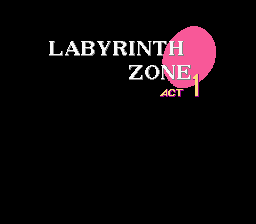 Each act also have this beginning panel, all except the first level. It seems they somehow forgot to add the Greenhill Zone title card. Here is the Labrynth Zone, filled with Jelly coloured water. Mario will slow down in water, but his palette won't change. It also has fully working bubbles for air. 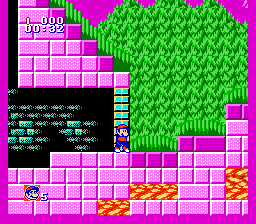 Starlight Zone still retains most of its level design, but Mario does have a tricky time getting through it, like this tall ledge here.